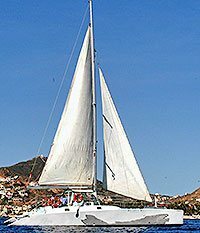 Take your group sailing on this beautiful 48' catamaran in Cabo San Lucas, Mexico, and create a vacation memory that you will never forget. This exclusive private boat is specially laid out with big front trampoline to capture that ultimate catamaran sailing experience of listening to the front pontoons splash over the waves. It features shaded areas, two bathrooms (one for ladies and one for gentlemen), and a ladder for easy access to the ocean for snorkeling. The catamaran is fully crewed for your sailing pleasure, and features an all-you-can-drink open bar, good time sailing music, and of course snorkeling equipment is available. It is amazing to watch the sun set into the Pacific over the famous Arch of Cabo from the open deck of a catamaran. We can snorkel at some of Cabo's best snorkeling locations such as Santa Maria Cove, or even watch for whales during whale season. The ways to enjoy this beautiful private catamaran are almost limitless. The day is yours, you name it!